The visit with doctor de Vos was very nice. I would definitely recommend her to other patients. I have Dr Karizaan de Vos to thank for restoring my confidence, loving my new smile. 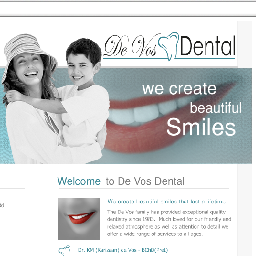 Dr Karizaan de Vos brought back the sparkle in my smile (: thank you for your excellent work and care. Doc de Vos is aaaamazing! Feels like a family unit every time you need to go and super accommodating. She even helped my cousin who is insanely scared of needles through a root canal by being super patient and understanding. I drive through all the way from Dalmas to see her because I won't go anywhere else.